I don’t know about you, but once this stage of winter hits my skin has had enough! Just over a week ago, my family and I headed out to the mountains for a little break skiing. I’m just getting back into it and I’m definitely going to make it a regular activity. One thing I don’t like about being on the mountain is the toll the wind and cold takes on my face and how dry the rest of my skin can get. I have found some products I really like, but I’m always on the lookout for natural based products that still have a glamourous side to them. 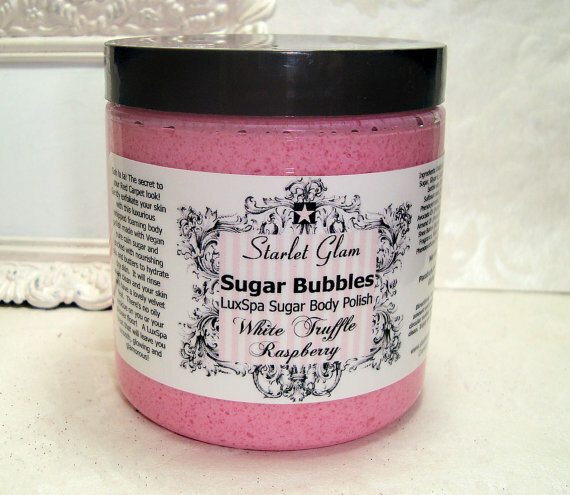 When I came across the next shop in my Etsy feature series, Starlet Glam, I was intrigued by the luxurious looking products with names sounding good enough to eat! 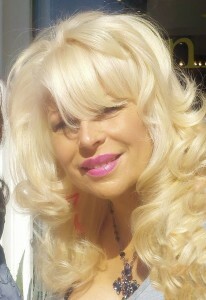 Peggy Paliotta grew up in Rhode Island. At an early age, she showed interest in dance, arts/crafts, painting, graphic design, jewelry design, and modeling. While she loved having this variety in her life, she felt like she was pursuing too many creative things at once and there seemed to be a missing piece to her puzzle. In 1998, while living and working in NYC, Peggy grew tired of working many 9-5 office jobs in various industries and eventually her creativity and spirit suffered. Around the same time, she came across an article on DIY handmade lip gloss. Intrigued, she viewed their web site and noticed they carried soap bases/supplies. In her spare time she taught herself to make her own, dabbling with various natural soap bases, fragrances, butters, etc. 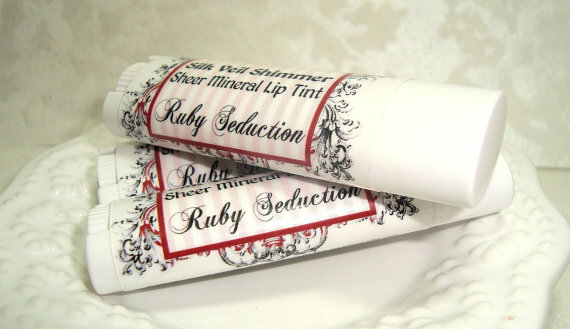 In 1999, she launched A Splash of Renaissance, Bath & Body collection, selling online and at the Extracts Show. It was at this time that she discovered her true passion and the missing piece to her puzzle. After 13+ years in NYC, Peggy relocated back to Rhode Island. In 2006, Starlet Glam was born. Peggy has always had an entrepreneurial spirit and an addiction for bath and beauty products; as well as old Hollywood glamour. She draws her inspiration from this era. She loves creating the products, names and, in particular, the packaging: Old Hollywood Glamour….with a French provincial twist. She considers herself to be very detail oriented, ambitious and a perfectionist. She feels like a crazed scientist at times, but she takes pride in everything she does and she always welcomes a challenge. Initially, Peggy was going to design her own business website as she did previously, but building traffic takes quite a lot of time. Then she stumbled upon Etsy after hearing about the online marketplace of handmade goods and artisan products. She thought it would be a great venue due to its popularity and amount of traffic it gets. Peggy’s process involves a lot of research, as she normally spends numerous hours just researching various recipes (sometimes from medieval recipes as well) to incorporate in her soaps; as well as themed names for some of her body products. Starlet Glam soaps are handcrafted using an all natural (like cold process) vegetable glycerin soap base in which she customizes with skin loving oils, butters and fragrance oils. Her body creams/butters are 96-98% natural and are Paraben free. The shea butter body balm, milk bath fizz, perfume oils, lip balm, and lip tints are made from scratch. Peggy’s favorite product is her handmade Shea Butter Body Balm. Shea butter is known to have healing properties for the skin. It’s so silky and melts on contact! Her best seller is the variety of whipped soaps. They’re like soap in a jar. The Coconut Cream and the Red Velvet Cake are very popular. Right now Peggy is working on some new products, including cupcake soaps, body creams, sugar scrubs and new lip balm shimmers. Besides trying to establish additional wholesale accounts, Peggy’s ultimate dream would be to open up her own retail store. I’m focusing on this, as well as renting a kiosk space at a popular mall. What does Peggy love most about starting Starlet Glam? This giveaway is now closed. Go here to find out the winner. 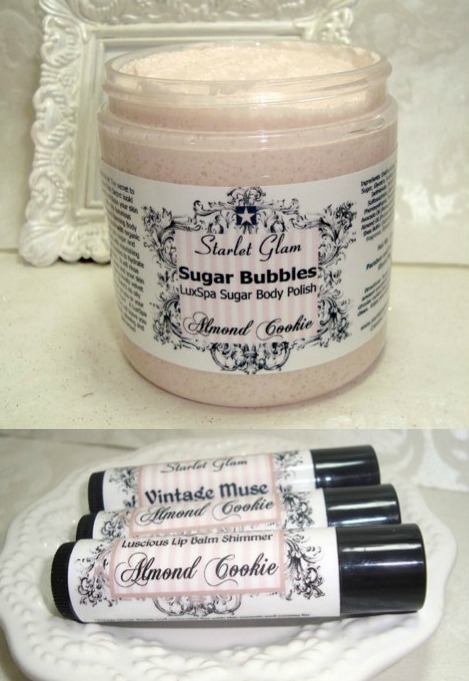 Peggy is generously giving away her Almond Cookie Sugar Scrub and Lip Balm Shimmer. The luxurious whipped foaming body polish will gently exfoliate your skin and the smooth and creamy lip balm will repair and add luscious softness to your lips. To be entered: visit Starlet Glam and come back and leave a comment below about which item(s) you like the most. Your information is kept strictly confidential and is used for award purposes only. Open to residents of Canada and US. Contest closes Thursday, March 8, 2012 at 8 pm MST. Winner will be announced on Friday, March 9. If winner does not claim within 48 hours, another name is randomly selected. I truly admire Peggy for following her passion and developing her own line of products. Impressive, wouldn’t you say! The red velvet cream sounds amazing! Thank you so much for the feature Shauna! It looks Fab! I’m glad you like it! It was fantastic getting to know you and your business better! wow! not only does everything sound wonderful, the packaging is so pretty! The blueberry Lemon Verbena body cream sounds fabulous and the whipped soaps look divine! The ginger lime body cream sounds heavenly! My favorite product is Orange Blossom and Sandalwood Natural Body Butter with Shimmer 2 oz. My favorite product is Orange Blossom and Sandalwood Natural Body Butter with Shimmer. What a lovely giveaway! Thank you so much for offering such a lovely and generous giveaway. My favorite item is the Orange Blossom and Sandalwood perfume oil. 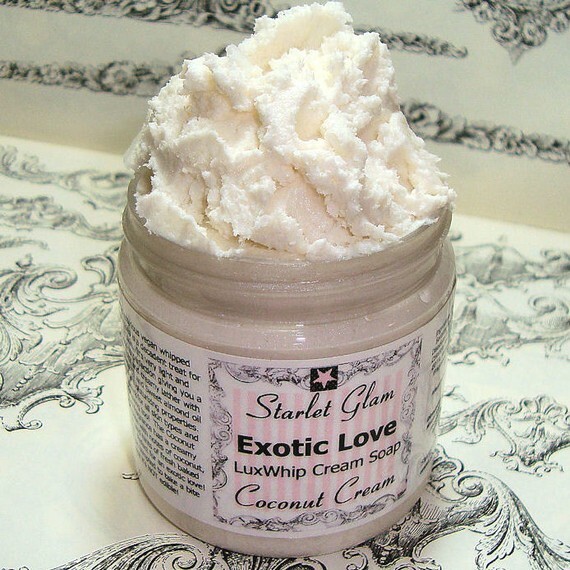 All of her items look amazing, but I would love to try the whipped soap! And since coconut is a scent I can never resist that would be over the top! Great giveaway! The whipped soap looks incredible!